The stamp celebrates 175 years jubilee: So what was the role played by modern architecture and design on it? This year, the little scrap of paper will have been around for 175 years. Yes, the stamp is celebrating a very special anniversary. Printed in batches on large sheets right from the beginning, it is one of our earliest mass-produced items. In England, May 6, 1840 heralded a new age of mass communication as on that day the first ever postage stamp was issued, the famous “Penny Black”, followed two days later by the “Twopenny Blue”, both of them featuring a portrait of the then 21-year-old Queen Victoria. From then onwards, without exception royal portraits depicting the protagonist in dignified profile in the style of Roman Emperors on coins graced postage stamps in the British Empire; and to this day, a miniature silhouette of the present monarch features on every stamp issued by the Royal Mail. In 1837 English master Rowland Hill had published a pamphlet on the reform of the postal service that caused quite a stir. The introduction of the postage stamp and the fixed penny rate associated with it was expected to radically reform the postal service in Great Britain. Not only in England, but also in other countries at the time it was customary for the recipient, not the sender, to pay for the delivery. Prices were based on the distance covered and the number of sheets of paper that went to make up the letter. Transport and delivery were a tedious process as the postman had to collect money from every recipient. On occasion he was forced to leave empty-handed, for instance, if the key information was simply written in cypher on the cover of the letter. The proposals made by Hill, who was commissioned with the implementation of his own reform, put a stop to these peculiarities. In his “Cultural History of the Modern Age” Egon Friedell draws a parallel between the introduction of the Penny post and the British head-start in mechanical engineering, railroad construction and steam navigation. “The majority of the German states,” as Friedell states, only opted for these innovations at the end of the 1840s. 1840 the first ever postage stamp was issued: the famous “Penny Black” featuring a portrait of the then 21-year-old Queen Victoria. “Postage stamps are adhesive tokens made of thin paper that tend to take the form of a landscape or portrait-format rectangle,” the German “Handwörterbuch des Postwesens” of 1953 states with deliberate matter-of-factness. In this manual postal technicians described numerous innovations, including paper selection, coating the stamp with gum Arabic, printing processes and, last but not least, the perforation of the sheets to facilitate detaching – likewise a British invention. Yet there is one dimension to the postage stamp that crucially exceeds its duty of promising safe delivery and seldom tends to feature in the official records of the postal services. The world of commemorative stamps represented an early virtual reality in which one could immerse oneself and go on a voyage of discovery. To lovers of stamps, or philatelists, the stamp promised what the collectors were unable to achieve in the real world: control on a miniature scale. Which nevertheless entailed a Sisyphus task as they were forever afraid of losing control. The first philatelists were “general collectors” and pursued the headstrong goal of acquiring every single postage stamp of all the world’s nations. Mind you, what already seemed a rather quaint undertaking shortly after the stamp’s invention would be a downright impossible endeavor today. Nonetheless some wealthy heirs and industrialists expended enormous sums and devoted extraordinary hunting prowess to completing their fantastic collections. After their deaths their bequests wound up in auctions and were ingested into new collections. Later, collectors began to focus on particular regions or themes. And it is for them that the postal administrations keep dreaming up ever new offerings, memorial editions, tete-beches, miniature sheets and other philatelist specialties. 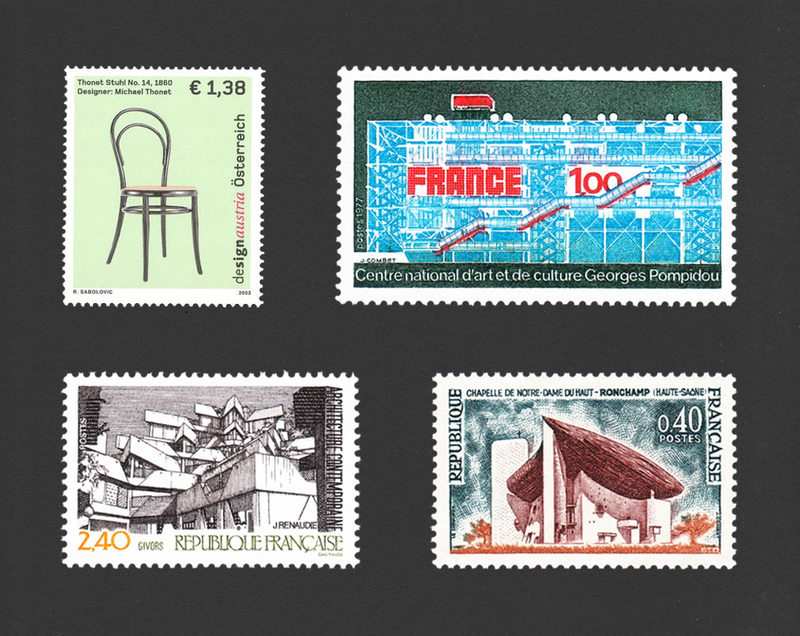 So what was the role played by modern architecture and design on stamps? It took years before Modernist design was deemed appropriate as a topic and theme. 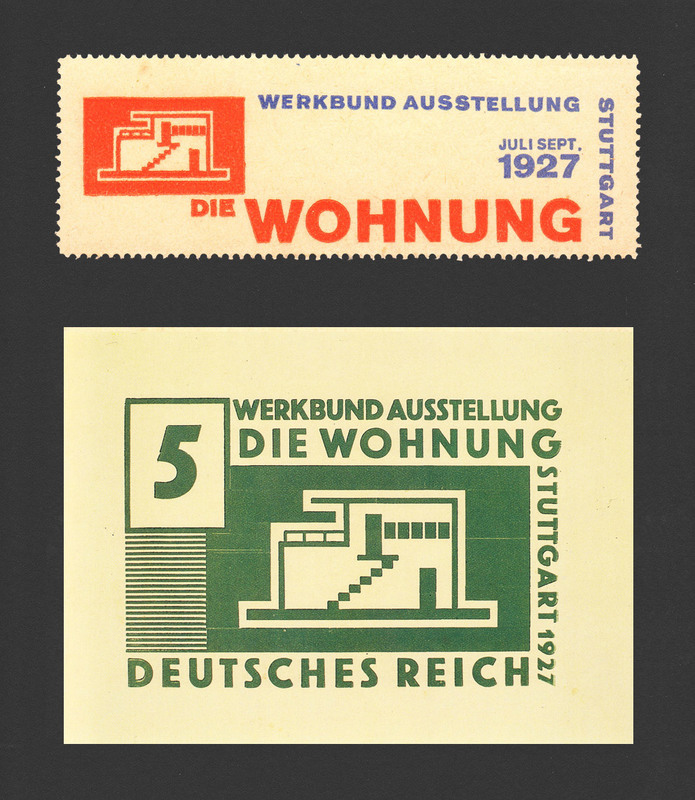 In 1927 “Die Form” journal reported euphorically: “The Reichspost administration is holding negotiations on issuing a commemorative exhibition stamp.” The idea was to bring out the stamp in the run-up to the Stuttgart Werkbund exhibition “Die Wohnung” (The dwelling) and it was created by painter and typographer Willi Baumeister, who had also designed the exhibition poster and catalog. His proposal for an abstract Modernist low building on the green 5-pfennig and the red 10-pfennig values was never realized, however. So Baumeister revised the design and turned it into an elongated vignette, introducing the font “Akzidenz Grotesk” for typographical refinement. Indeed, it was to be several decades before Baumeister’s own output as a painter was finally accorded due recognition on a German postage stamp: In 1989, on the occasion of what would have been his 100th birthday, Baumeister’s 1950s painting “Bluaxo I” appeared on a 60-pfennig stamp, designed by Heribert Burkert. Results of the artist competition for the redesign of the imperial crest and eagle, flags, stamps and seals, coins and postage stamps under the leadership of “Reichskunstwart” Edwin Redslob, designs by O.H.W. Hadank (Flugpost) and Otto Firle (Rheinland). 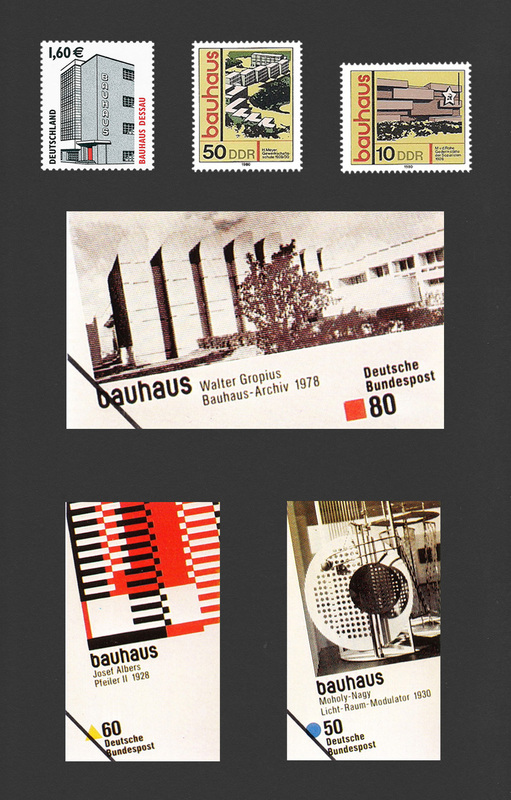 The “Staatliches Bauhaus Weimar” was founded in April 1919. Just 800 meters down the road from the progressive art college, the Weimar National Assembly began to convene as of July of that same year. It not only deliberated on and finally adopted the Weimar Constitution, but it also established the office of “Reichskunstwart”, or Reich Art Officer. The first candidate to be appointed to the position was art historian and Werkbund member Edwin Redslob in 1920. Redslob had competitions held for artists and commercial artists for the redesign of the imperial crest and eagle, flags, stamps and seals, coins and postage stamps. As regards the design of postage stamps he mostly looked to advocates of a more moderate Modernist thrust, such as Ernst Aufseeser and Oskar H. W. Hadank (who later came to fame with his tobacco commercials), who designed a series of airmail stamps featuring an abstract eagle. However, this “culture-based politics of gestures” expected to aid the transition from monarchy to democracy, as Redslob’s biographer Christian Welzbacher puts it, was doomed to failure, above all in relation to his stamps. In a catalog accompanying the “Künstlerische Formgebung des Reichs” (Artistic Design of the Reich) in 1926 Redslob took a critical look at the status quo of the day. He pointed to the difficulties in being the go-between for negotiations between artists, who insisted on a complete and faithful reproduction of their designs, and the Reich Post Office, which granted designers little leeway, “not more than the lettering and inside frame”. Things turned out quite differently. Not only did Baumeister’s commemorative Stuttgart stamp never actually grace an envelope – the New Building era did not feature on postage stamps in the Weimar Republic at all. It seems that none of the architectural projects (extensive municipal housing estates in Berlin and Frankfurt) were deemed suitable material for a commemorative stamp. Only historical buildings of past centuries were considered presentable. It was not until 2007 that on the occasion of its centenary Deutsche Post honored the Deutscher Werkbund with a stamp, which took its cue from a poster that Richard Herre designed in 1924. Anniversary – yes please, contemporary look – no thanks! 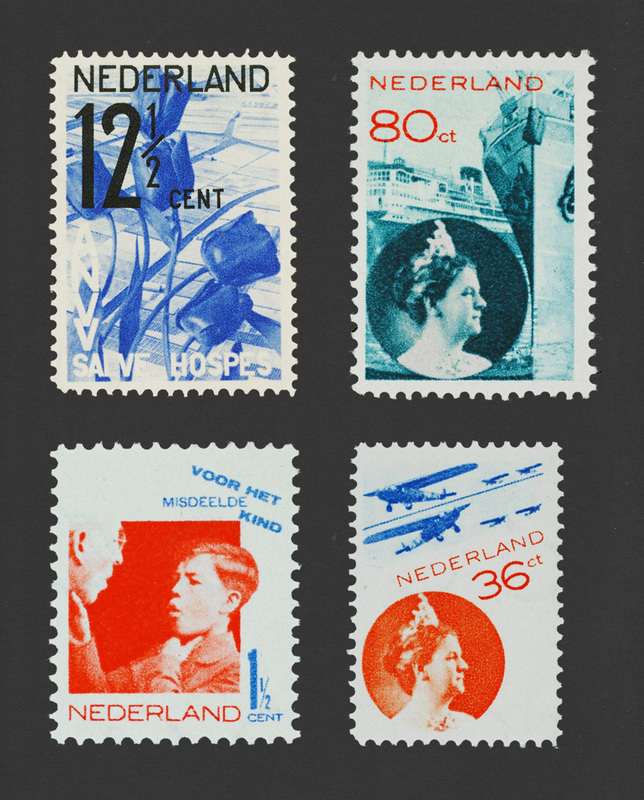 The Netherlands succeeded in Modernist representation in the 1930s like by Paul Schuitema’s “Salve Hospes”, Gerard Kiljan’s series “Voor het misdeelde Kind” as like as stamps by Piet Zwart showing Queen Wilhelmina. The Netherlands, by contrast, succeeded in eclipsing all German endeavors for Modernist representation as early as the 1930s. In 1932, in an article entitled “Photomontage on the stamp” the Werkbund journal “Die Form” presented some current series issued by the Dutch post. It was the first time the medium of photography was used, in combination with elements of typography and color. It was not welfare organizations, but their beneficiaries whom designer Gerard Kiljan portrayed up close. Yet his series “Voor het misdeelde Ki’nd” met with a decidedly controversial reception. Stamps by Piet Zwart showing Queen Wilhelmina in a photographic portrait and in traditional pose likewise had a colored background. The difference in composition was that Zwart combined the image with oblique typography, opted for photos of airmail planes, the smoking chimneys of an industrial plant or the close-up shot of a harbor scene. Another series by Paul Schuitema entitled “Salve Hospes” (Welcome guest) showed old and new tourist destinations in the Netherlands, playing with powerful contrasts and partially shot from a birds-eye perspective. Artist Georg A. Mathéy was directly commissioned by the Bundespost with the design of the “Posthorn” serie to demonstrate a decisive break with the Nazi aesthetic. 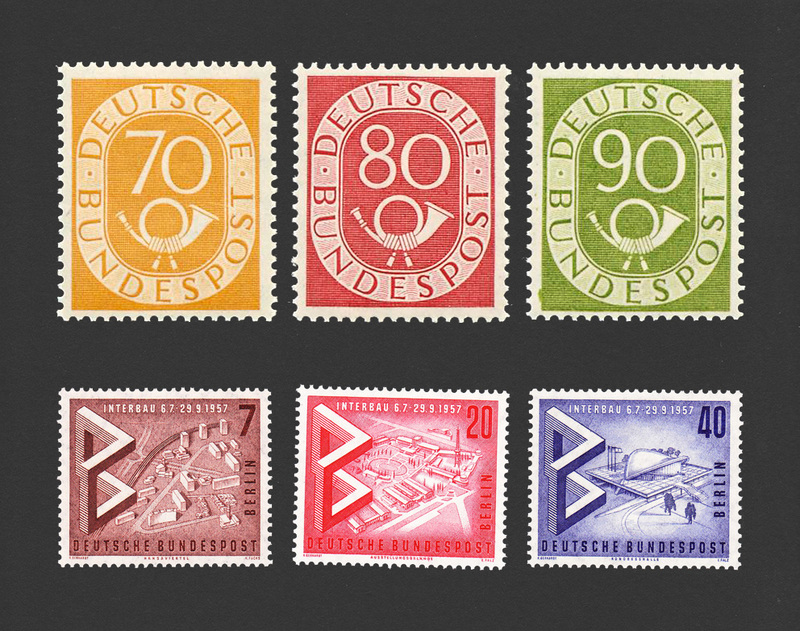 Graphic designer Rudolf Gerhardt created the stamps for Berlin’s Interbau. In the early days of the Third Reich, Ferdinand Spiegel depicted an anonymous “architect” as part of a national and stereotypical series on “professions”. Berliner Georg Fritz was not only the propaganda painter of the Reichsautobahn, but between 1936 and 1940 also designed the corresponding stamps, which the state cleverly exploited for propaganda purposes relating to its building activities, later dubbed “brutality in stone”. Was a Modernist visual idiom with democratic ambitions finally able to assert itself across Europe after the end of World War II? 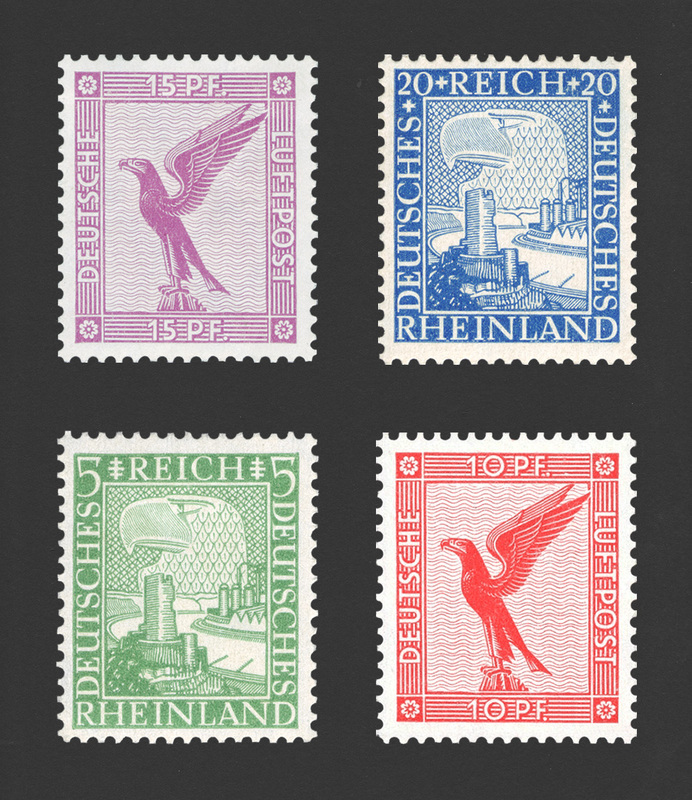 In Germany, around 1950 the Bundespost was busy trying to find a suitable long-running definitive series that would demonstrate a decisive break with the Nazi aesthetic. A design competition open to all inhabitants of the Bizone and West Berlin proved to be a complete fiasco. From among 10,000 entries submitted those selected by the jury were promptly rejected by the public. Even a second competition, this time held exclusively for invited graphic artists, did not produce a better result. As an alternative, the painter and graphic artist Georg A. Mathéy was directly commissioned with the design of the “Posthorn” series. Since the introduction of this definitive stamp entailed numerous delays (and this involved the creation of numerous sample prints and templates and different printing techniques being tried out for different postal values), the “Posthorn series” swiftly emerged as a collector’s field in its own right. The idea of the position of Federal Art Representative was no longer tenable. As an alternative, in 1954 the German Postal Minister established an “Advisory Council for The Artistic Design of Official Graphic Art for Deutsche Bundespost” – which almost coincided with the formation of the German Design Council. Even to this day the “Arts Advisory Council”, which consists of a changing team of graphic artists and university professors, watches over the quality of stamp design. It works under the aegis of the “Program Advisory Council”, which is composed of numerous representatives of associations and the church and decides on the theme of the annual program. Today these advisory councils are assigned to the German Finance Minister, who makes the final decision on all designs. 1974 the Conference of the European Postal and Telecommunications Administrations (CEPT) inspired Switzerland to issue two commemorative stamps, one of which depicts the sculpture “Kontinuität” by Max Bill (right down). In 1978, Finland used the CEPT theme “Architectural Monuments” to represent the sanatorium in Paimio, designed by Alvar Aalto (right up). 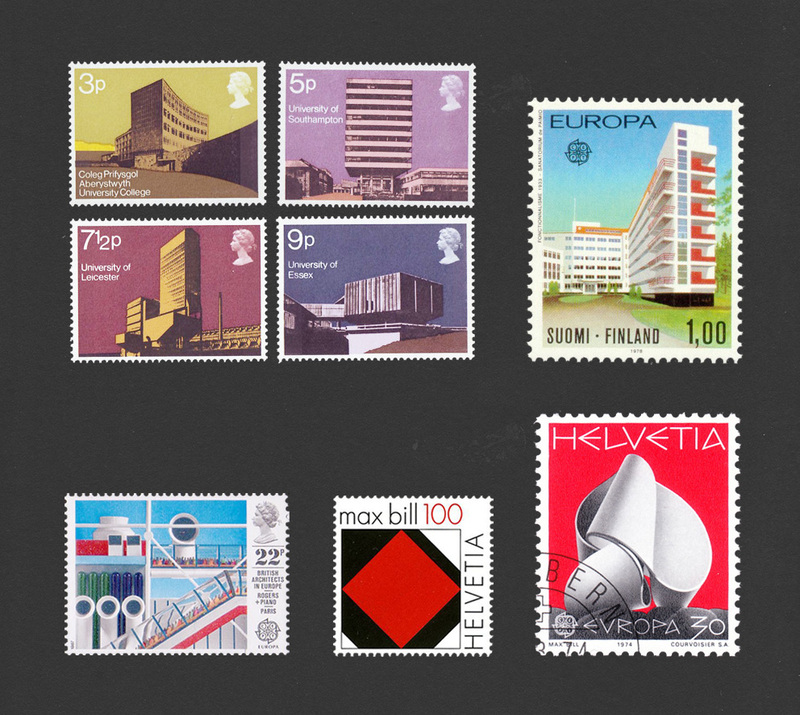 1987 the Royal Mail showed buildings of British architects (left down). Aby Warburg had himself alluded to the themes of European Union and Understanding in his stamp designs. In 1956, the Conference of the European Postal and Telecommunications Administrations (CEPT) began to develop common stamp series for all of Europe, with one series coming out each year. In the first few sets, the images selected to visualize “Europe” included the building site of a tower (1956), the wheel of a car (1960), an abstract flower (1964), and even a Greek temple (1969). As of the mid-1970s, the common image for all CEPT states was replaced by a topic the design of which each nation was expected to construe for itself, with the letters CEPT simply being included on the face of the stamp. Right in the beginning, in 1974, the theme of “Sculpture” inspired Switzerland to issue two commemorative stamps, one of which depicts the sculpture “Kontinuität” by Max Bill, who was also responsible for the stamp’s design. In 2008, on the occasion of Max Bill’s 100th birthday, the Swiss Post honored the sculptor with the rendering of a “red square” balanced on a corner as a Concrete Artist, but not as an architect or designer. In 1978, Finland used the CEPT theme “Architectural Monuments” as one of the first countries to represent modern architecture in a European context: the sanatorium in Paimio, designed by Alvar Aalto. Over the next few years, the majority of CEPT stamps dabbled with history, destined to evoke eras set firmly in the past. For the “Modern Architecture” theme in 1987 the Deutsche Bundespost opted to combine past and present. One image is devoted to an isometric view of Mies van der Rohe’s “Barcelona Pavilion”, which had been reconstructed in the Catalan capital shortly beforehand. The other shows the Köhlbrand bridge devised by Egon Jux, which was inaugurated in 1974. 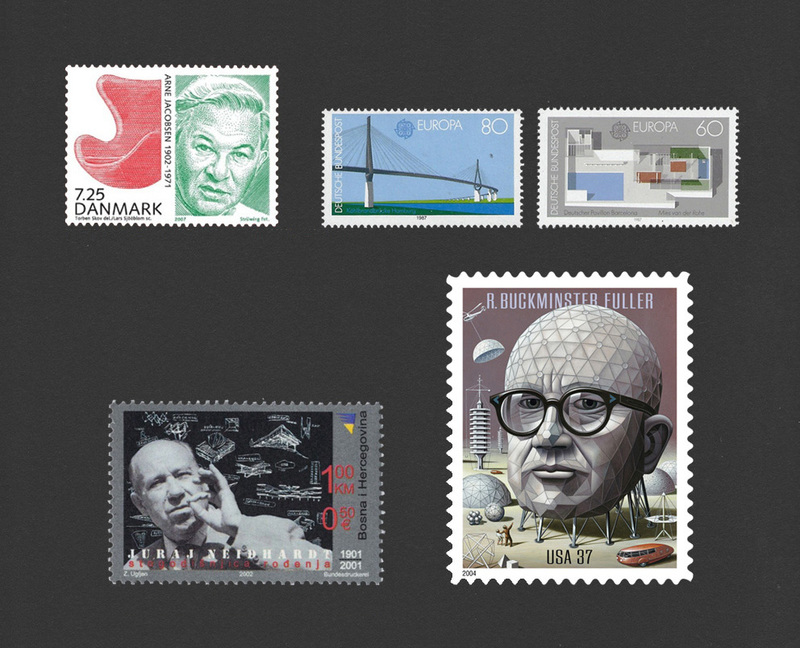 As early as 1986, Deutsche Bundespost Berlin actively honored Mies van der Rohe as the architect of the New National Gallery – with a designated stamp range that remained in circulation up until German reunification. Despite it being well-proportioned, the 50-pfennig stamp demonstrates that stamp formats hardly do justice to architects – as buildings are hardly recognizable when reproduced on such a miniature scale. The same can be said for Le Corbusier (1972, Switzerland) and Alvar Aalto (1976, Finland). A rather good example is Arne Jacobsen (2007, Denmark). By contrast, the design of the US stamp commemorating the granting of the patent for Richard Buckminster Fuller’s “geodetic dome” 50 years earlier is rather original. On it, Buckminster Fuller’s head has been transformed into an elevated dome structure. In addition, other designs by the master are recognizable, such as the “Dymaxion Car”. The idea for the image stems from Boris Artzybasheff, who as cover graphic artist for Time Magazine realized it decades ago on the Time cover dated January 10, 1964. The 1990s witnessed the privatization of many postal operators. The result: a greater variety in stamp designs, which however often introduced a greater level of arbitrariness. Furniture and product design featured as random topics, in Australia just as they did in Brazil, Austria, Portugal, Slovenia and the Scandinavian countries. In 1998 and 1999, Deutsche Post honored “design in Deutschland” with a block featuring four designs each, one from the period between 1900 and 1925 and one between 1958 and 1984, each of which presented a concentration of designs and applications at the time: from a set of glasses by Peter Behrens to Peter Raacke’s Mono flatware to Alexander Neumeister’s Transrapid. In 2000 and 2001, the Italian post office responded with blocks on “Design Italiano” which predominantly featured furniture and luminaires. The first historical block presents four objects on one commemorative stamp. While the “Charles + Ray Eames” block issued by the United States Postal Services presented a similarly colorful mix: 16 commemorative stamps celebrating the diversity in the work of the designer duo. Moreover, the block proudly presents the only portrait of a woman designer – Ray, pictured next to Charles. While the first female architect to have a commemorative stamp devoted to her output is Zaha Hadid for her “Bergisel Ski Jump” in Austria in 2012. And in August 2015 the Irish “An Post” will publish a commemorative stamp in honor of Eileen Gray. Architecture and design would seem to be gaining in significance: „British Design Classics“ (2009, Royal Mail ), the Fagus factory by Walter Gropius as an issue on the Unesco World Cultural Heritage (2014) and to celebrate 50 years of diplomatic relations between Germany and Israel, the two states have joined forced and -issued an architectural tete-beche depicting the New Building style in Tel Aviv. 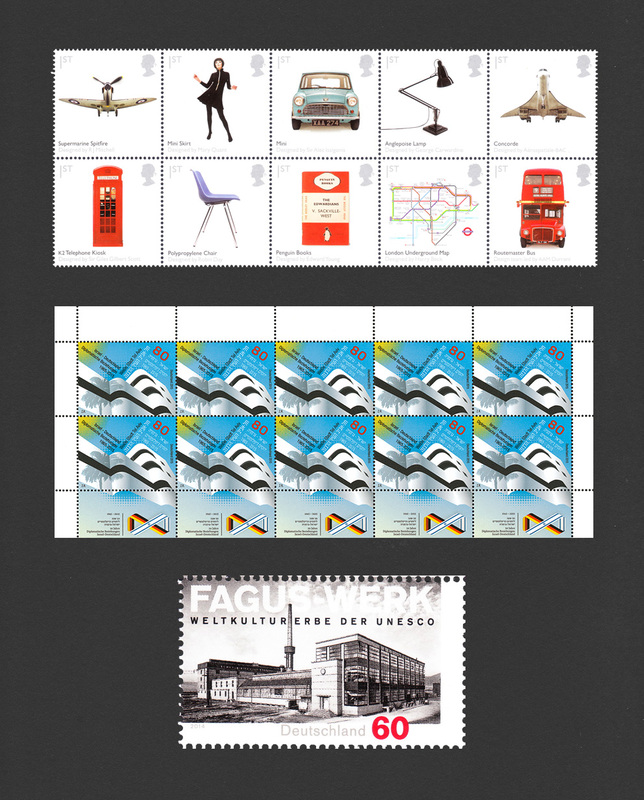 In 2009, Britain’s Royal Mail brought out the “British Design Classics” series with images ranging from the “Spitfire” combat aircraft to Mary Quant’s “Mini Skirt” and Edward Young’s “Penguin Books” to the “Routemaster Bus”. Quite uninspired by comparison was US Postal Services’ 2011 series on “Pioneers of American Industrial Design”, which presented handy everyday commodities. 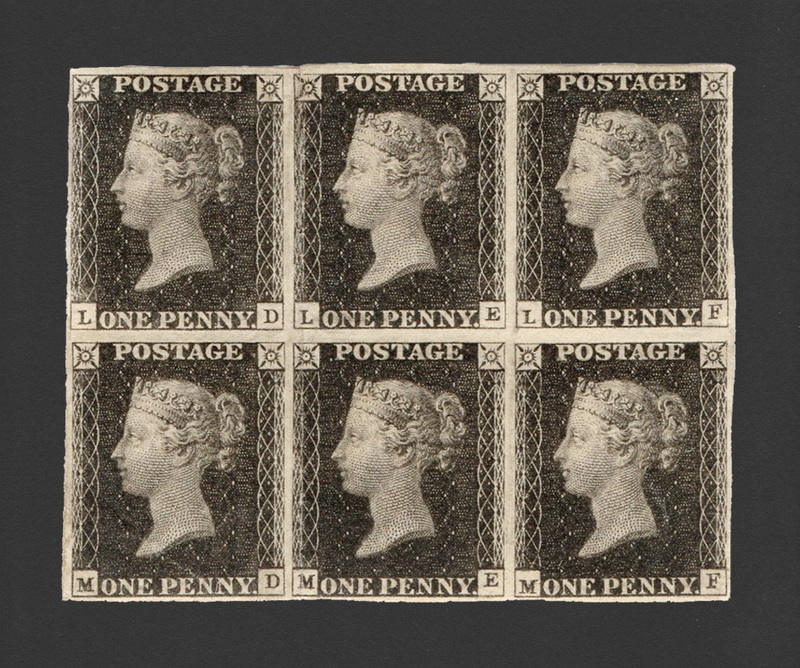 The block of 12 reveals its target group only all too clearly – it has no postal value printed on it. Walter Benjamin predicted that the seed of the postal stamps planted in the middle of the 19th century would “not survive the 20th century”. Was he right? In the new world of postal images architecture and design would seem to be gaining in significance. For instance, to celebrate 50 years of diplomatic relations between Germany and Israel, the two states have joined forces on the occasion of the 175th years stamp jubilee and issued an architectural tete-beche depicting the New Building style in Tel Aviv. An issue on the Unesco World Cultural Heritage (designed by Christof Gassner) in 2014 presented the Fagus factory by Walter Gropius as an early example of Modernist architecture. And those still looking for more can create their own designs on the Internet using the Deutsche Post “Briefmarke Individuell” service – and put it into circulation.